eDocs - The exclusive electronic travel folder containing guest itineraries, eTickets, maps, regional info & much more! Transfer costs are already included in the nightly accommodation rate. 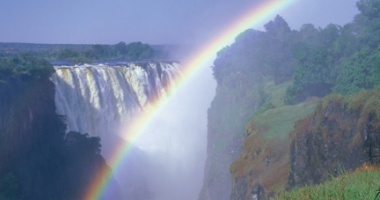 There are an incredible variety of great National Parks to visit, the most popular being the Moremi Wildlife Reserve and the Okavango Delta, which is the worlds largest inland delta, a seasonal wetland of channels, palm lined islands and wide grassy floodplains, visible from outer space. 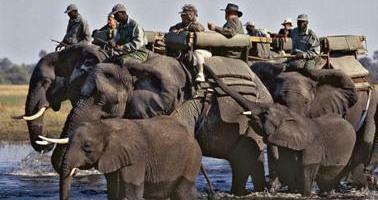 The Chobe National Park is to the north of the country and is home to the largest elephant herds in the world. This Park boasts four distinctly different eco systems: Serondela with its lush plains and dense forests in the Chobe River area to the northeast, the Savute Marsh in the west and the Linyanti Swamps in the northwest, with the hot, dry hinterland in between. The Makgadikgadi Pans National Park is situated between Maun and Nata, in northern Botswana. These great thirstlands cover some 4,900 square kilometres of lifeless land which transforms when the rains come in mid-November. They retain their water into April or May, attracting a spectacular array of water birds and stimulating dramatic migrations of wildebeest and zebra. 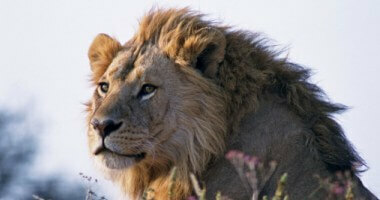 The Central Kalahari Game Reserve is situated in the centre of Botswana. This reserve is characterised by vast open plains, saltpans, ancient riverbeds and the world renowned Deception Valley. The Basarwa or San Bushmen have been resident in this region for thousands of years, remarkably surviving in a harsh climate of sporadic rainfall, varying from 170 to 700 ml per annum. Situated in Kasane, directly on the border of the Chobe National Park and within 150m of the Chobe River front is the well-priced Chobe Bush Lodge. Across the road from its sister property, Chobe Safari Lodge (CSL) allows guests easy access to CSL’s river view, while Bush Lodge overlooks the National Park, thus offering a land and water setting. The lodge has 42 rooms in three blocks that includes four family rooms (two bedrooms both with en-suite facilities). Rooms are a modern bush style design with the ground floor rooms including a verandah while the top rooms have balconies with views over the National Park. Rooms are spacious with an open-plan bathroom featuring a bath and separate shower; air-conditioning and television. Lodge facilities include a restaurant and bar with views over the bushveld, a swimming pool and lounge deck, curio and craft shop and viewing platforms overlooking the Park. There are WiFi hotspots in the communal lodge areas as well as a health and beauty salon across the road at CSL. Activities from Chobe Bush Lodge include game drives in the park (excluding park fees) and Chobe River boat cruises. Optional activities on offer include Namibian village walks, visits to the reptile park and fishing (additional charges apply). Please note: Bed Levy of USD1.5 per person per night is excluded and is payable locally. Cash Bar available on board. Park fees of $12.00 per person is excluded and is payable locally. Subject to change without prior warning. Park fees of $12.00 per person is excluded and is payable locally. Subject to change without prior warning. Includes: Tea, coffee and rusks. Shared Road Transfer - Chobe Bush Lodge to Kasane Airport. Transfer costs are already included in the nightly accommodation rate. Please note: Luggage allowance is 20kgs per person in a soft bag whose dimensions should not exceed 25cm (10in) wide, 30cm (12in) high and 62cm (24in) long). This includes hand luggage and camera equipment. In order to avoid having to purchase an additional seat Mack Air must be advised in advance of travel if a passenger weighs 110 kg (242 lbs) or more. There may be up to three stops en-route to a passengers final destination. Please note: Departure tax of USD12.00 per person (2018) and USD15.00 per person (2019). Subject to change without prior notice. Includes: Includes all meals, local brand drinks, 2 safari activities daily, return Mopiri airstrip transfers and laundry. Mopiri means ‘Little Island’ in the local Bayei language. The camp is surrounded by crystal clear Delta water on all sides. The camp sits on a three-kilometre lagoon perfect for leisurely sunset cruises. 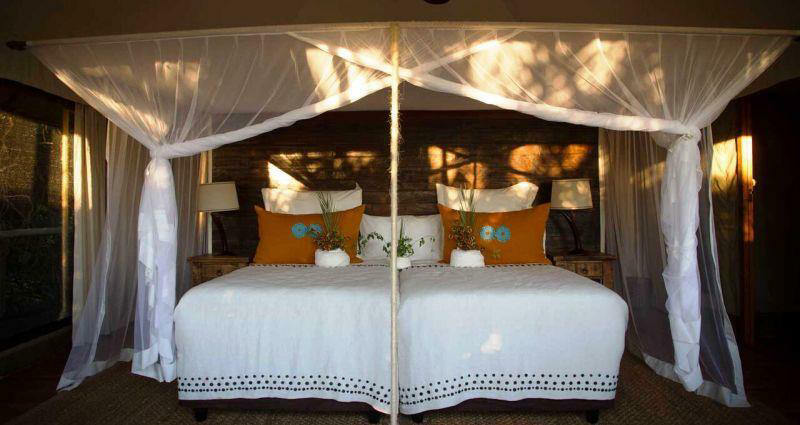 Seven spacious en-suite tents are set on the banks of Weboro Lagoon offering panoramic views. Long winding board walks between the main area and the tents offer guests privacy and the opportunity to stretch their legs and explore the island. 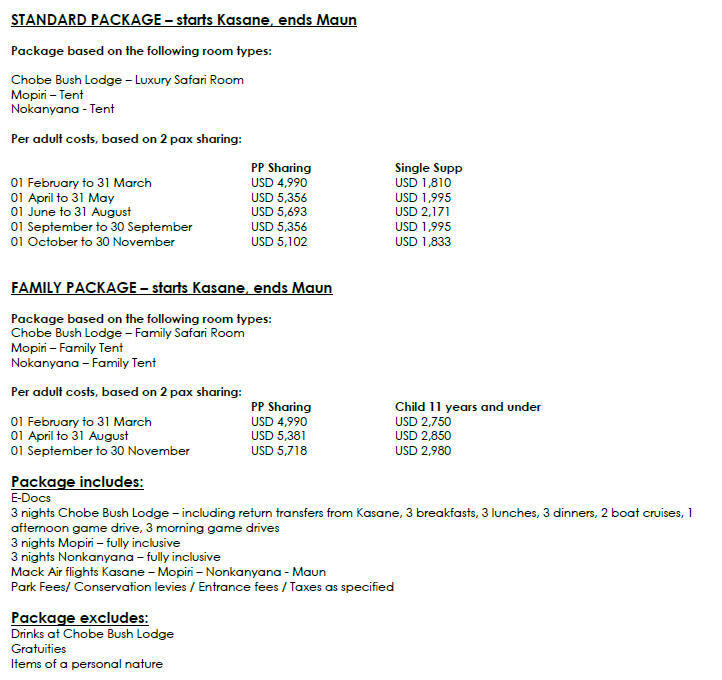 Includes: Includes all meals, local brand drinks, 2 safari activities daily, return Khwai airstrip transfers and laundy. Seven luxury tents, and three family units are set on the banks of the Khwai River offering guests a wonderful spot to sit and watch wildlife coming down to drink. The rooms are light and spacious and all have a separate bathroom, with inside and outside showers. All rooms can be made up as twins or extra kings. The main area consists of a large dining room, with a separate lounge area. There is a large deck with a fire pit overlooking the river, and a boma that sits in front of camp by the waters edge. Meals will be served in a variety of al fresco locations. With one of the owners being a renowned chef, Nokanyana aims to offer their guests a unique dining experience, with the chance to try some local delicacies when available. 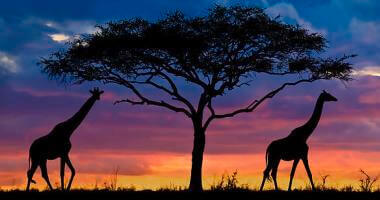 Nokanyana focuses mainly on game drives and bush walks. Please note: Khwai River landing fee of USD15.00 per person must be added if guests are not staying at Khwai River Lodge. Subject to change without prior warning.